Is this a good substitution for handstand push-ups and why? No Excuses CrossFit, Suwanee, Georgia. Check presentation at St. Jude Children's Research Hospital from 2012 CrossFit For Hope. CrossFit For Hope 2013 is July 6th. Video from St. Jude: "Thank You CrossFit"
CrossFit Level 1 Certificate Courses: CrossFit Atlanta, CrossFit 714, CrossFit Charlotte, Rogue Fitness, Peak 360 Fitness, CrossFit Strong, CrossFit Scottsdale, CrossFit Maximus, CrossFit Reebok Stockport, CrossFit Reebok Gurgaon, CrossFit 506. What could this athlete do to more efficiently complete muscle-ups? Jeremy Thiel 10:05, Michael Winchester 11:10. Post time to comments. CrossFit Tour, Big Sky Event 2012, Hangover WOD. How could this athlete improve his rowing? Jae-Hwan Kim's outdoor gym, Korea. CrossFit Level 1 Certificate Courses: CrossFit Atlanta, River North CrossFit, CrossFit X Factor, CrossFit King of Prussia, CrossFit Scottsdale, CrossFit Norcal, CrossFit Park City, CrossFit Velocity, CrossFit Brisbane, CrossFit Asia, CrossFit Reebok Loreto. CrossFit Coach's Prep Course: CrossFit Reebok Stockport. As shown in frames 1 through 3, the explosive closing of the hips generates momentum used to elevate the athlete over the bar in the butterfly kip. The new CrossFit Community Site is live! "One Race, Every Medalist Ever", The New York Times. Sarah Hopping 175lbs. Post loads to comments. Erin Cafaro and the US Women's Eight rowing team on the way to gold. Andrea Ager 3:40. Post time to comments. 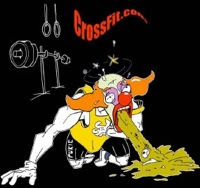 Val B. back to get in a WOD after a year hiatus. Good to see you again. "Restlessness is discontent and discontent is the first necessity of progress. Show me a thoroughly satisfied man and I will show you a failure."